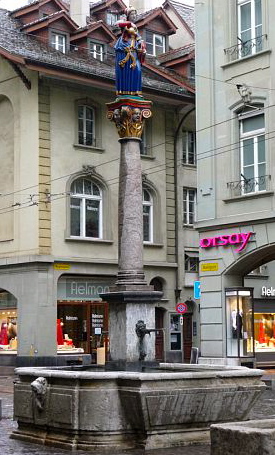 In Part I (Bern Baby, Bern) of my post about the capital of Switzerland, I promised a Part II about the brilliantly colored historical fountains that are landmarks of the medieval city of Bern. There are over 100 public fountains, eleven of which were carved from 1542 - 1549 and are topped with prominent statues depicting characters from history or folklore. All the original fountains were built as a public water supply for the city's inhabitants and served over the centuries as local congregation spots. A surprise for our group of 11 people who hadn't done much research on visiting Bern, the first fountain we encountered was Pfeiferbrunnen, or Piper Fountain. It was designed after the 1514 Albrecht Dürer woodcut of the Bagpiper and originally stood in front of a hotel for traveling minstrels. A piper, dressed in blue and playing a bagpipe, with a golden stork at his feet, crowns a bright red column decorated with bells, jesters, gargoyles and flowers. Shortly thereafter we came upon the Anna-Seiler-Brunnen, or Anna Seiler Fountain. Anna Seiler was the founder of the first hospital in Bern in 1354. The stone pillar she stands on was brought from the Roman town of Aventicum. Her hospital, now known as Inselspital, still exists today. Next there was Schützenbrunnen, or Marksman Fountain. The marksman holds a shooting banner and a sword. I found the Zähringerbrunnen, or Zaehringer Fountain, amusing. The founder of Bern, Berchtold von Zähringer, commissioned the statue of the chainmail-wearing bear with the headpiece that looks like an old scuba helmet. The Simsonbrunnen - Samson Fountain - represents the Biblical story of Samson killing a lion. The fountain was originally built of wood in 1527 but was replaced with stone in 1544. The Vennerbrunnen, or Standard Bearer Fountain, stands in front of the 15th century city hall building. A Venner is an old German word for a soldier in medieval Switzerland who protected the city and led troops into battle. The Venner on top of this fountain is dressed in full armor and holds a banner. These Renaissance fountains dot the streets of the historical city of Bern and add surprise and color to the narrow alleyways, decorated façades, and cultural sites of this treasured UNESCO World Heritage Site. The fountains are great. It's so much fun to discover wonderful and quirky things when you travel.